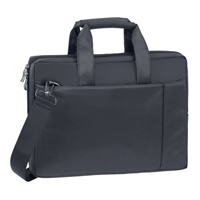 Padded laptop compartment walls provide extra protection. External pocket for accessories/tablets Front pocket panel provides basic organization for mobile phone, documents, & accessories. Dual zipper pulls for easy, quick access. Comfortable padded handles and a removable, adjustable strap with anti-slip shoulder pad. 15.16" x 10.43" x 1.77"
15.55" x 11.61" x 2.76"